Hart's Island was a the site of a Civil War hospital and cemetery and now is the largest cemetery in the US with over a million pauper graves. 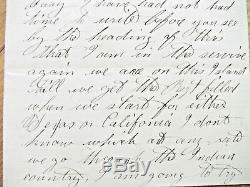 An original Civil War Soldier Letter from Frank Paige, 42nd US Infantry at Hart's Island, New York, Jan 15, 1867 to a friend- he's re-enlisted and his regiment is bound for Texas or California by way of Indian Territory; he received his letter while in Boston, but was unable to write or get leave to "come up to the Fair and dance with the girls" as as he was " so damned busy". Sgd Frank W Paige, 42nd Regt USA, VRC (Veteran Reserve Corps). 2pp ink 8 x 5 edge wear, Overall VG. Paige served with the 5th Massachusetts Cavalry, then the 42nd Regt VRC after being wounded in action 7 times including once by ambush at Johnson's Island, Ohio by a group of the Copperhead Knights of the Golden Circle. 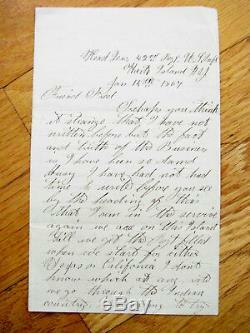 Postwar he was a notable US Army War Department clerk, serving under General Phil Sheridan to 1887. 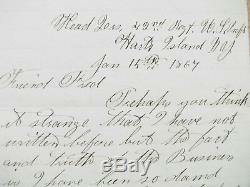 This is the only Hart's Island Civil War letter I have seen. Reference Journal GAR Massachusetts Encampment (Vol 35 1901-04, Page 99). General Orders and other imprints. All items are unconditionally guaranteed to be authentic and in the condition as described. PLEASE READ DETAILS OF THE ITEM DESCRIPTION. I TRY TO DESCRIBE ALL ITEMS ACCURATELY. 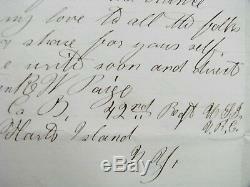 The item "HARTS ISLAND NEW YORK CIVIL WAR LETTER" is in sale since Sunday, June 3, 2018. 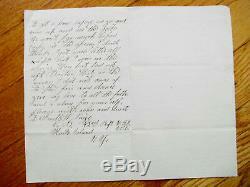 This item is in the category "Collectibles\Militaria\Civil War (1861-65)\Original Period Items\Correspondence, Mail". The seller is "99counties" and is located in Winterville, North Carolina. This item can be shipped to United States, Canada, Mexico.